A blond, blue-eyed daughter, I looked like the perfect blend of my mother and father. As others commented on the likeness, my parents smiled inwardly, knowing it was their heavenly Father who had chosen the custom matching of their adopted daughter when he provided “a home for the lonely” (Psalm 68:6, New American Standard Bible) or, according to the King James Version, set another solitary in a family. Older when they commenced the adoption process, Oliver and Mary Ennis were willing to commit to nurturing a child. Eventually they welcomed to their home an abandoned child with pneumonia. She had lain so long on her back that the back of her head was bald. I was that abandoned child. Most children spend many years with one or both parents. Because of their age, my parents knew it was unlikely they would enjoy the normal number, so they maximized each year to its fullest. Celebrations were important in the Ennis home. I recall well the January 31st when I arrived home and found the dining room table set with Mom’s best linen and china. Lying across my bed was a new dress. My favorite black patent leather shoes were awaiting my feet. I was 10 years old. Without giving me extensive details—my parents explained many things to me but did not feel obligated to try to make a child understand all adult decisions—I was helped to dress for dinner. Dad arrived in his best suit and a special dinner was served. He then began the explanation for the celebration—January 31st was the day they brought me home from the hospital, six months after my birth. I was not their birth child but was very special because they had chosen me. That evening we celebrated the day I joined the Ennis family. Dad’s explanation made the subsequent transition to salvation smooth. Salvation was like being adopted into God’s family. How could I not desire heavenly adoption when my earthly adoption was so wonderful? James picks two synonymous adjectives to define the most spotless kind of religious faith—that which is measured by compassionate love (see John 13:35), orphans and widows. Those without parents or husbands were and are an especially needy segment of the church. Since they are usually unable to reciprocate in any way, caring for them clearly demonstrates true, sacrificial, Christian love. To adopt is to “legally take another’s child and bring it up as one’s own.” Since through God’s grace Christians are accepted into his family without limitation or restriction and enjoy all of the rights and privileges bestowed upon his children, they should readily grasp the concept of adoption. Ephesians 1:5 states, “He predestined us for adoption to sonship through Jesus Christ, in accordance with his pleasure and will.” The theological basis of adoption assists the believer in comprehending that the goal of adoption is to exhibit the glory of God’s grace. The spirit you received does not make you slaves, so that you live in fear again; rather, the Spirit you received brought about your adoption to sonship. And by him we cry, “Abba! Father!” The Spirit himself testifies with our spirit that we are God’s children. Now if we are children, then we are heirs—heirs of God, and co-heirs with Christ, if indeed we share in his sufferings in order that we may also share in his glory” (Romans 8:15-17). • Moses was essentially adopted by Pharaoh’s daughter (Exodus 2:1-10). • Samuel was left in the care of Eli the high priest rather than being nurtured by his biological mother, Hannah (1 Samuel 1:1, 2–2:21). • Esther was adopted as a child by her adult cousin, Mordecai (Esther 2:7). • Jesus was nurtured by his stepfather, Joseph of Nazareth (Luke 2:4, 41-50). • All believers are taken from their natural father, the devil, and adopted into God’s eternal family (Galatians 4:3-7). • There is significant financial and emotional expense associated with human adoption. However, those expenses are insignificant when compared with the cost of a believer’s adoption into God’s eternal family (Galatians 3:13; 4:4, 5). • The process of legal adoption requires careful planning and execution of a myriad of legal formalities. This detailed process is a reminder that our heavenly Father planned far in advance for our adoption—he predestined us for adoption before the creation of the world (Ephesians 1:4-6). • Most children available for adoption need to be rescued from precarious situations. Such was our state when God adopted you and me. Adoption is a reminder that by nature we are children of wrath (Ephesians 2:3). Though the distance between who God is and what we are is great, he still chooses to adopt us into his family. • Legally adopted children have the privilege of receiving full rights of inheritance from their parents. This legal privilege prompts believers to recall that as children of God, we become his heirs (Galatians 4:6, 7). God appointed his Son to be heir of all things (Hebrews 1:2). Every child adopted into God’s family is a joint heir with Christ (Romans 8:16, 17). Adoption is an issue that is on the heart of God. Reflecting again on James 1:27, we are reminded that “Religion that God our Father accepts as pure and faultless is this: to look after orphans and widows in their distress.” Practically speaking, this means reaching down to the abandoned person who is helpless and may die without our physical care and spiritual nurturing. The plight of the orphaned reminds us of the love of God, call us to sacrifice, and challenges us to value Christ-likeness above our comfort. Not everyone is called to adopt, but within the Christian community there are probably more individuals who should consider it. Are you willing to ask your heavenly Father, “What do you have for me in relation to adoption?” His response might just change the course of your life. Dr. Patricia A. Ennis is a freelance writer in Burleson, Texas. Adoption and foster parenting provide hope for children who need love, support, and protection. While not all of us can be adoptive parents or foster parents, we can help ensure these kids grow up to have successful and healthy futures. Here are five ways you can help adoptive and foster kids. 1. Help with schoolwork. 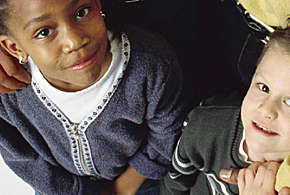 By the time they reach third grade, 80 percent of foster kids have had to repeat a grade. Tutoring adoptive and foster kids helps them get caught up and gain confidence in their skills, and it shows them there are adults who care about them. 2. Help them develop budgeting and life skills. Transience and trauma mean that kids miss out on many of the basic skills we take for granted. As a result, they struggle to succeed independently. Training them in basic skills helps them have a healthy future. 3. Provide a place to live once they’re 18 years old. In most places, foster kids are expected to live on their own beginning at age 18. Providing housing, helping find housing, or funding housing for one of these young adults gives them safety and stability. 4. Teach them confidence and relational skills. These are other areas where transience and trauma rob children. Coming alongside them to guide and encourage them is a powerful statement of love. 5. Help them write a new story. Helping foster and adoptive kids reclaim a positive future is the best way to help heal the scars of the past. Meet them where they are and find ways to give them the opportunities, truth, and love they may have missed.